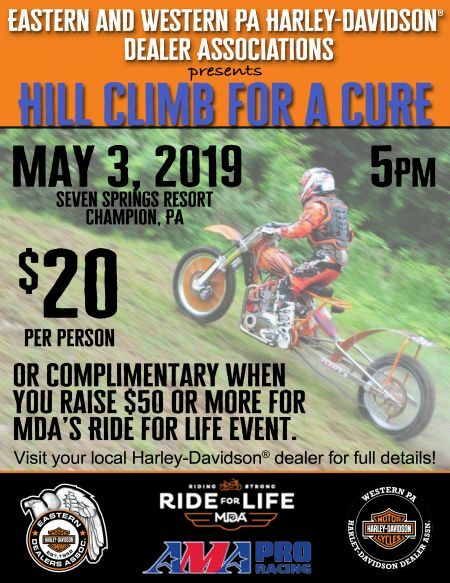 Eastern and Western PA Harley-Davidson® Dealer Associations present the Hill Climb for a Cure! May 3rd at Seven Springs Resort in Seven Springs, PA. Gates are open all day, but the race begins at 5pm. You can prepurchase tickets starting April 10, 2019 at your local Harley-Davidson® Dealer, or get in FREE when you raise $50 or More for MDA's Ride for Life Event! *Visit your local Harley-Davidson® dealer for full details!